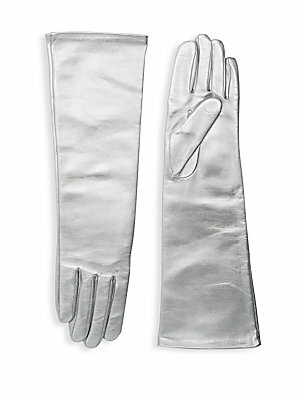 Metallic leather gloves with supple silk lining in an opera-length add instant drama. Silk lining Lambskin leather Dry clean by a leather specialist Imported SIZE 16.5" long. Soft Accessorie - Womens Gloves. Agnelle. Color: Silver. Size: 7. Metallic leather gloves with supple silk lining in an opera-length add instant drama. Silk lining Lambskin leather Dry clean by a leather specialist Imported SIZE 16.5" long. Soft Accessorie - Womens Gloves. Agnelle. Color: Silver. Size: 7.5.